Christmas is a wonderful time of year for many of us. 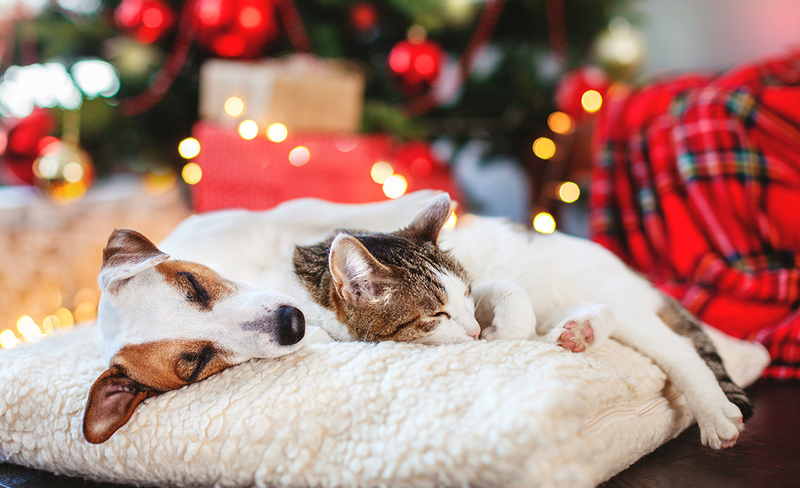 The twinkling lights, festive food and children’s excited faces alone make it a special family time and as cherished members of that family, our pets need some attention around Christmas too. Our playful pets can find dangling, sparkling objects hard to resist and they might be tempted to play with them and pull them down. If they’re chewed and broken, then bits can get caught in their digestive systems and cause some problems, and they can be toxic too. 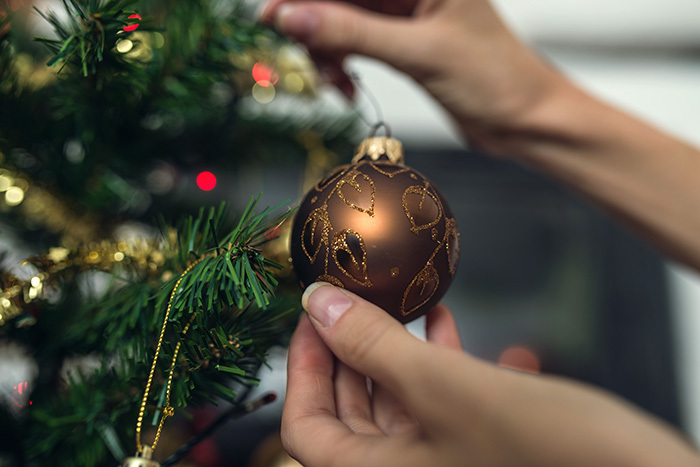 Tinsel can easily become tangled around them, so try to keep decorations out of their reach if you can. As delicious as they are, edible tree decorations are just asking for trouble when you have pets. Even placing them high up isn’t going to be enough to deter intrepid food-mad pets and this can cause damage at home and damage to your pet when they eat possibly toxic foodstuff, wrappers and all. Keep fairy lights and other cables out of reach, in a room your pet isn’t allowed in to unsupervised, or buy a sturdy cable guard online or in a hardware store. Rabbits in particular love to hide behind a sofa and have a chew on something new and rubbery, but cats and dogs can enjoy this too. A surprising number of the plants and much of the foliage around at Christmas can be poisonous to animals. 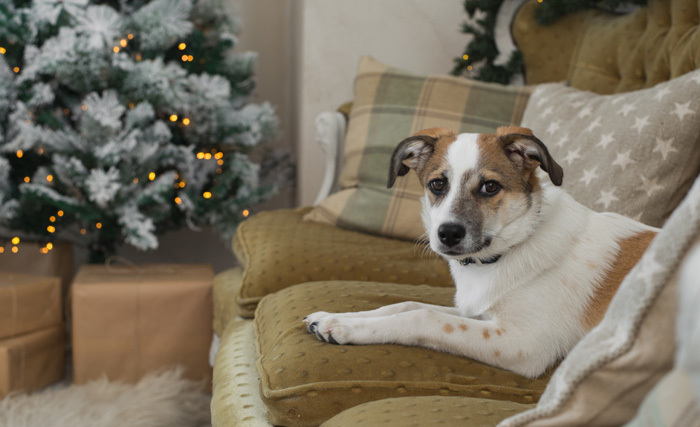 The list includes holly, mistletoe, pine trees including the needles, amaryllis and poinsettias can all have a nasty effect if chewed on so put them in rooms your pets can’t get to or well out of their reach. Make sure you sweep up or vacuum fallen needles from under Christmas trees – real or artificial. Unfortunately, many of the delicious treats we look forward to all year are no fun for pets either. Anything with raisins or sultanas in such as mince pies, Christmas pudding or cakes are toxic to them as is chocolate, onions, grapes, broccoli and cauliflower, salty food, slices including pepper and nutmeg, alcohol and garlic. If you’re cooking poultry – turkey, chicken or any game bird – make sure you don’t give your pet the bones to chew on as these can shatter and get stuck anywhere along their digestive tract. If you’re giving gifts that include food, keep them in a cupboard or in a room your pet doesn’t go in to rather than keeping them under the tree. They WILL be hunted down and eaten otherwise – wrapping paper and all! Some pets are more determined to grab any food available than others. If you have a dog or a greedy cat!) who loves to scavenge, watch out for any changes in the way they behave that might suggest they’ve eaten a cheeky mince pie whilst granny’s back was turned. Signs to look out for include changes in the way they breathe, upset stomach (either diarrhoea and /or vomiting) and twitching. If you have any concerns, do feel free to call us during normal opening hours or contact our out-of-hours service to discuss whether you need an emergency appointment. Home can be a busy place over the holidays. If you have visitors coming, then be aware that your pet might find this overwhelming or become over-excited. It’s a good idea to prepare them in advance for a situation like this and make a safe, quiet space for them to go to if it all gets too much. You could put their bed in a spare room, or make a cosy area behind the sofa if you don’t have a room available they can retreat to. Don’t be afraid to let your guests know what they need to do to keep your pet safe such as which gates and doors to keep shut. Take your dog out for a good walk before any guests arrive, or if anything unusual is going on like visiting people or going out for an extended period. They’ll be a lot happier and much less anxious if they’re tired. Fireworks are inevitable over Christmas and New Year. To keep them calm, follow our guidelines for keeping them relaxed during fireworks. Walk dogs and let cat’s out during the day so they’re happy to stay in during the evening. Make a den for them, keep curtains and blinds closed so they can’t see any fireworks, and put the radio on or leave the TV on to block out sudden loud noises. If fear causes your pet distress that is more than an understandable anxiety, make an appointment to come in and talk to us about how we can help. We can discuss the use of nutraceuticals (drug-free diet supplements and plug-ins) to help calm your pet. There might also be some additional techniques you could use that would suit your particular circumstance, or if necessary we could refer you to a behaviourist who could tackle any deep-rooted problems. Make Christmas fun for fluffy family members! We know that all of the above makes Christmas sound like a miserable time for animals. It doesn’t have to be. We just want to make sure everyone stays as happy and healthy as possible, and it’s better to be aware of things and take the small steps to keep everyone out of danger can be faced with an emergency vet trip just as the whole family sits down for Christmas lunch! If you’d like to give your pet a present, then we sell a great range of suitable, safe toys and chews, as well as a fun selection of Christmas bows and pet Christmas stockings! Don’t forget, if you have any queries or need to make an appointment over Christmas our opening hours are here.